CSIR-UGC-JRF-NET for June 2018/December 2018 in Physical Sciences. 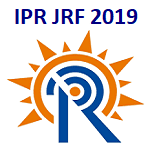 Eligible Candidates can Submit IPR JRF 2019 Online Application at the Official Website of IPR Latest by 20th April 2019. Applicants First Open IPR Official Website. Click on IPR Application for Junior Research Fellowship 2019 for PhD. Open JRF 2019 Advertisement Link. Apply by Clicking on Register Link. Send Application Hard Copy Along with Required Testimonials and Send it in a Sealed Envelope Superscribed with Advt No. and Post Applied for...by Registered Post/Speed Post. Application Send to the Address : INSTITUTE FOR PLASMA RESEARCH, Near Indira Bridge, Bhat Village, Gandhinagar- 382428, Gujarat, India. Application should reached Latest by 27th April 2019.